One of the great things about craft beer is most brewers will take a moment to talk about their products or just talk about brewing in general with people. You have those great people… then you get a chance to speak with Crooked Stave owner Chad Yakobson who takes all that a step further. You can tell right out of the gate he not only loves beer and loves brewing funky/wild beer, but is dedicated to educating the drinker. Chad is the mind behind one of the best beer related research projects I know of: his Masters degree dissertation called “The Brettanomyces Project”. 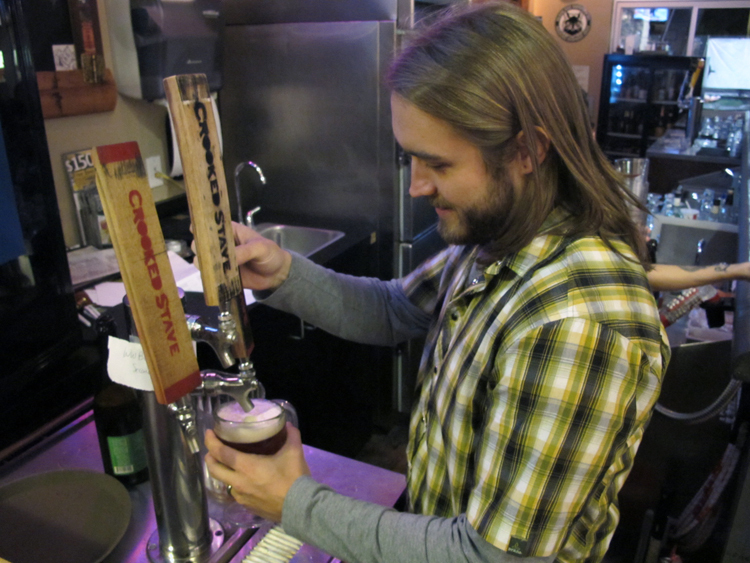 Last year his research won the award for Best Paper in the Master Brewers Association of the Americas. For those of us who have embraced the funk in our own home brewing set up this is an extremely helpful resource in brewing Brett beers. ETF- Everyone who enjoys sour and wild beers has that epiphany… that one moment they embrace the funk. What was the beer that turned you? Chad- My sour epiphany was La Folie. I was going to college in Ft Collins and studying Horticulture Science… really grape growing for winemaking. I was really getting into red wine and especially barrel aged wine. But all of a sudden there was this beer that New Belgium had. I think it was around 2003 or 2004 just as they were starting to get their program going…and wow it was barrel aged beer. I loved my beers, but I hadn’t seen a barrel aged beer before….I was young and in college. So I tried it and I was like WOW this tastes like saurkraut! I didn’t have any sort of reference or anything to compare it to or something I knew of, but I tried it and it was interesting. So I tried it again and tried it again… the next thing I knew it was this beer my friends and I couldn’t get enough of it. So that was it for me, I just didn’t understand other than the fact it was barrel aged how it got this flavor and how it got these characteristics. I would really say I’ve been pulled in ever since, nearly obsessed. ETF- Speaking of getting into sour/wild beers, what beer from Cooked Stave would you say is a good gateway beer to get someone hooked? Chad- I think we have 3 actually and they all lead into each other. One is going to be the Wild Wild Brett Orange that is part of the series of 100% brettanomyces beers that play off the color wheel (ROY G BIV). The orange I’m going to bring back as a year round beer, it’s going to be called Saint Bretta. It’s going to stay the same, but have a few tweaks. It’s a 100% brettanomyces beer that has that cusp of acidity in the beer, but also that little bit of coriander, that little bit of orange… these citrus units. I actually call it citrus units as does another brewer friend who likes to refer to them that way as well. That is a great gateway beer I think for anybody because it’s coming with these flavors that are not “beer like” as we know them. Like with sours it’s hard to say this is a beer but it is, yet it’s got these candied tangerine and key lime characteristics. But it also has a hint of that brett, hint of the acidity and tartness. That’s great to start to getting the cogs rolling and realizing that ok this is 100% brett and this is interesting. The other one is Petite Sour, which as well is going to be a full time year round beer. This beer weighs in at about 4% and the idea behind it is my version of a table beer. It’s Berliner Weisse meets Gose meets Farmhouse Wit, so it’s a tart witbier. It has an acidity level but it’s tame. It has the fruitiness from the brett (which is very characteristic of our beers as it is) but also some of the beer background as well because it’s a blend of a 100% brett beer blended with a saison farmhouse type wit which is not in oak. That beer marries all these flavors together to where it’s approachable. It’s light, crisp, clean and lemony. Those 2 beers really start getting the idea “Oh I can do this, I like sour beer” because it’s not all the way sour. The next is our Golden Sour. It’s kind of the final pull to really bring people in. This is a golden beer that is 100% brettanomyces fermented. So the brettanomyces flavor is coming upfront and right off the bat…but the souring from the lacto and barrel is afterwards. The idea is that it’s not “all the way sour”, but it still has all the qualities of it. So between going through each one of those beers they really pull the drinker in and that is the goal behind Crooked Stave. Sours are not one dimensional; in fact even though I keep saying sour, I’m kind of against the term “sour” in a way. We make a difference between pale ale and an IPA, but we know what the differences are. The same thing for the wild beers, they don’t have to be tart… there are varying levels of tart. But there are also varying levels of balance and that’s what brings drinkers into these beers as well. It’s not the power of what’s most sour, it’s the power of what has the most expressive characteristic, what has the brilliant bright flavors. The way I look at it sour is the extreme of it. I see “Wild Ales” as being the broader of the category and you’ve got sour on the extreme level of it. So if sour is on the far end as the most tart then you have varying levels all the way through. For instance I would consider the Wild Wild Brett Green a wild beer simply because the same reason a Saison is a Saison, what really makes it a Saison? The fact that it’s got Saison yeast in it? Pretty much. So to me what makes a wild a wild is the fact it has brettanomyces in it. 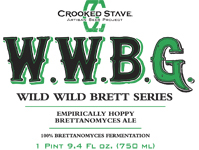 So secondary brett beers can be wild or primary fermented beers could be wild. In our WWBG the primary fermenter is brett with hops so it tastes like an IPA. It has the passion fruit / dark stone fruit sort of dark berry IPA but its still wild because it has the brett in it. So it’s all about education to inform the consumers that it’s not just about the sour and there are varying levels for them to understand. ETF- So is the sour versus wild a pretty big misconception in this type of style? Chad- Absolutely. 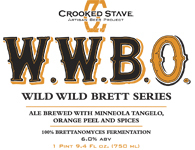 There are 5 underlying factors in the Wild Wild Brett series of beers. One is to re-train the way people think about brettanomyces and these wild beers. That’s why each one is a different recipe, each one is a different beer and each one is very different in the way it’s produced and brewed. The idea is to slowly re-train people about brettanomyces. Brettanomyces ferments clean albeit not as clean as a lager or a saccharomyces. But if you compare it to a saison strain for instance the differences genetically are not that much and the differences flavor wise are not that much either. Brett just takes it an extra step further. That’s the way it should be thought of. Now acidity comes from bacteria and I’ll give it that brett creates a tiny bit of tartness. The idea is not to allow a lot of oxygen for these beers and therefore not a lot of tartness will occur. So these beers come out very clean, with beautiful esters and flavors. So you can limit the amount of phenolics and amount of brett character. It will always have an underlying brett character in it, but that’s the beauty and that’s the way to use this yeast. That is what makes it wild. It’s this designation us as brewers have come up with and it’s the understanding that by using non saccharomyces yeast. Even though we are using it purposely. Sour on the other hand is a beautiful art in using these yeast in any way. Those beers deserve the recognition in what that are. The fact that they are barrel aged, extremely manual and extremely labor intensive. The amount of time and the blending that goes into making one… it takes a true artist. So it’s a great variation between one end the wild beers and the very far end of the acidic long barrel aged beers. Us as brewers are trying to educate ourselves and that was a large part of me doing the masters degree research I did. None of us knew why these fermentations were happening, what the flavors were or anything to that effect. But we knew it happens and we knew we really liked the effects it was having on the beer. I wanted to study that and dig deeper to get a better understanding. Now that I do I’m trying to educate about these differences. We are going to see a plethora of these beers and really we already are seeing them. So the more the consumer and us as brewers can know the better experience we are going to have. That’s what drinking a beer is all about, the experience. ETF- Going back for just a second…the 2 beers (Wild Wild Brett Orange and Petite Sour) that are coming back full time. What’s the time frame for a full time release? Chad- Sadly it’s as soon as the brewery is built in Denver. I’m going to be doing Petite sour here again soon, but as long as I’m brewing at Funkwerks I can’t do anything year round. Just because I’m not able to brew enough. So when the brewery is built in Denver I’m going to brew it year round. It’s really fun the way we are playing around with things. It will be Petite Sour Blanc and then Petite Sour Noir so the idea behind them is they will be table beers: a white and a dark. The dark will be a bit higher alcohol, browner with more maltiness and a smaller amount of sour. The blanc is more golden and lighter. So we will be able to play with seasonal variation. In order to do that I’m going to need foudres year round specifically for the Petite Sour and a fermentor or 2 just for it. Plus one for the Saint Bretta just to have all of those going. ETF- Where did the name “Crooked Stave” come from? Chad- I was really having a tough time naming the brewery. I kept coming up with these different things. 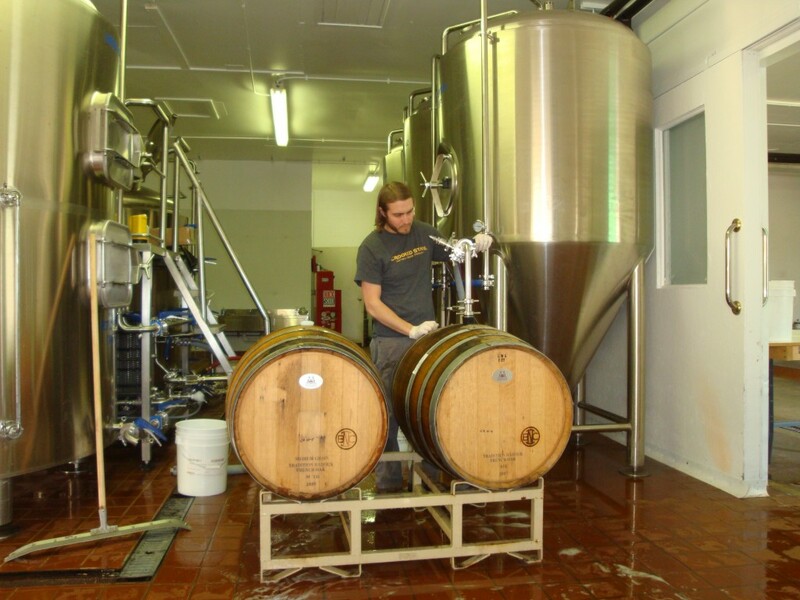 Oak is very central to our brewery and its an underlying theme of what we do. 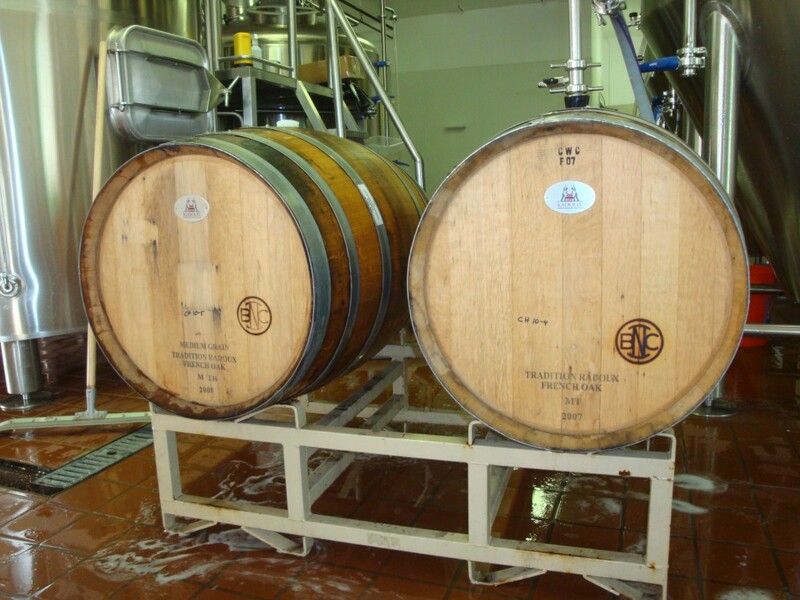 My favorite thing is to put beer in to oak and see how it comes out on the other side, I love the long barrel aging. I was looking at what makes up our brewery and what makes up a barrel. 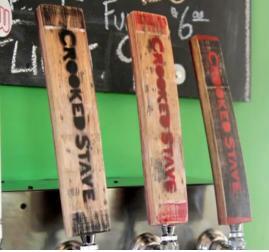 Staves are what makes up a barrel so I see what we are doing at Crooked Stave being very different, a different model, a different line of beers and a different idea. It’s a very different approach. It’s very much a wine maker’s approach to making beer is how I think about it. So a crooked stave is the one in a barrel that is different. At the same time I think it’s artsy and sounds neat. All of that portrays what we are and the central theme in our brewery. ETF- In the short amount of time Crooked Stave has been open we’ve come to expect some new unique beers. What’s the newest one you are working on and what’s just hit the barrels? 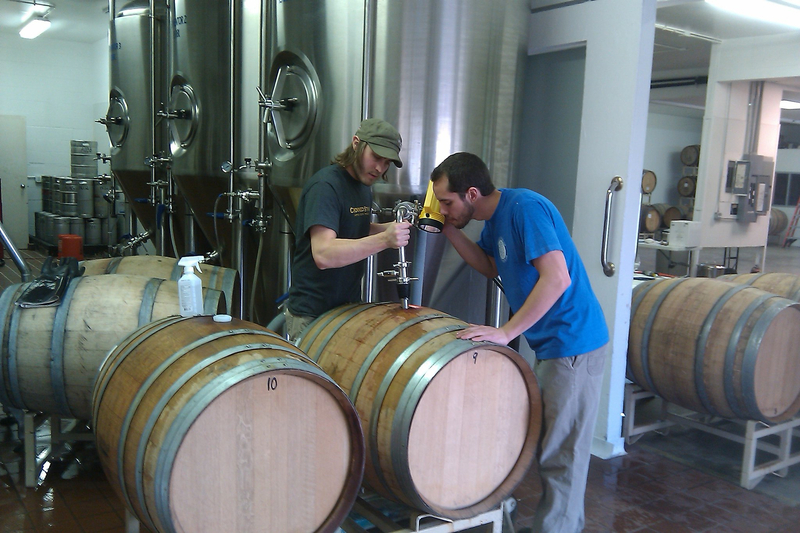 Chad- Well from the standpoint of the most recent thing I filled barrels with was the dark sour. But I think the new one with the neatest properties or characteristics is the one called “Nightmare On Brett Street”. It’s a very fun beer to brew. I essentially took a re-worked baltic porter recipe, which I love Baltic porters. I took this recipe and worked it over to the point where I could build the mouthfeel plus build all the flavor and characteristics. 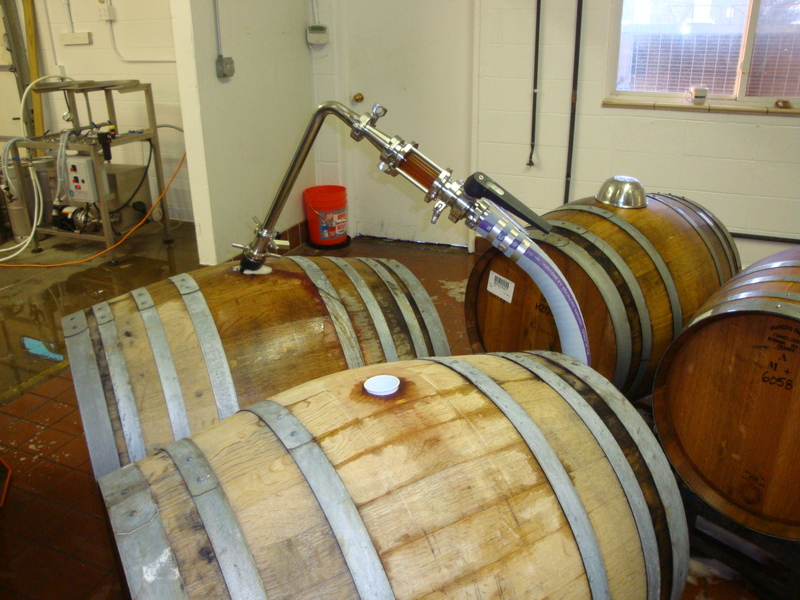 Then primary ferment it 100% with brettanomyces and have that in various barrels. I got some really nice fresh barrels: Cognac barrels which have French oak, some really nice Brandy barrels that came from Heaven Hill and also some Heaven Hill Bourbon barrels. So I’m really excited to see the way this beer turns out because I’m more use to working with wine barrels and neutral wine barrels at that. So this is a beer I’m trying to get those flavors in and I’m really looking forward to the way I blend it. I think it will make a really nice Grand Cru Nightmare On Brett Street that’s this brett Baltic porter. It’s all about turning heads and being different so I think this one is something people will get into quite surprising saying “This is brett? This is a cognac barrel?” I think it will really be exciting! ETF- With your barrel program growing how will be able to sustain this current program while relocating? Chad-Very very carefully haha. Basically everything will get put on a large semi and moved down to Denver. It will be difficult, but the idea is just to load them up. They are pretty stable in the barrel, you could make an argument why it is good to rouse the barrels, wine makers rouse their barrels. Even now we take the barrels and put them on a pallet to shake them back and forth just to get some of that brett/bacteria that may have fallen down back up. What’s going to be more tricky is when it comes time for me to make blends and empty if we are not already brewing again. I am very big on being close to my barrels. Keeping them topped so if I empty those barrels I need to be filling them. With how little I am able to brew currently that will be tricky. Which is once again why we need to get down to Denver and make the move quickly. ETF-Staying with those plans to move, about a month ago you launch a very cool Cellar Reserve program (details click here) to help with the relocation project. Tell me about the membership and some exciting points people are going to like. Chad- The membership is a really exciting thing for the members and me personally. While we have a base of sours we will be doing, for me it is about experimentation. Even if it means taking some of those bases and adding various fruits to them, putting them into different kinds of barrels or blending them in a special way from different barrels to make special blends. These are not things that can not be done on a larger scale. The Cellar Reserve membership gives me the ability to what I see as reward the people who are really into what we are doing, really interested and supporting our brewery from the beginning. I guess the expression would be a grassroots movement, but more of grassroots support. We’ve seen so much support. Denver has been great to us, Colorado has been great to us and so have a lot of the people throughout the USA who are writing to know more about these beers. This program is my ability to give back to them. I myself come to the industry as a beer drinker who collects beers and trades beer. So this is something I am interested in doing, so I see it as rewarding. With these small barrel projects there can only be so much. With them comes exciting flavors and unique things that are not going to happen on a larger scale even if that scale being 15 bbl at a time. A lot of times it;s cost prohibitive as sometimes I’m putting $500-$600 worth of fruit just into one single barrel plus the amount of labor and time. I’m really excited about the peach beer that is going to come out. I got some beautiful Colorado peaches that are a very specific variety for flavor and aroma. The things we do with Petite Sour by taking that base beer then adding some really unique fruits to it will get some neat flavors out of it. 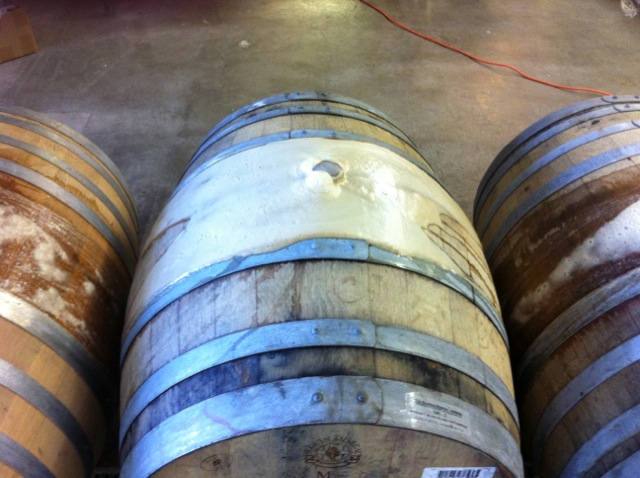 With that as well as show casing the first few spirit barrels I mentioned (Cognac, Bourbon and Brandy Barrels). Being able to take those and show them off, well the only way we can do that is through forming a Cellar Reserve program and being able to sell it that way. With so few cases it would probably be hoarded in the taproom, but I want these beers to get into the hands of people who are truly interested in looking for this product. It’s what I would want as a beer drinker and I really hope to reach our customers through it. ETF- Which beer in the Cellar Reserve series are you most looking forward to releasing? Chad- Wow That’s difficult because I know of a few that are going to be really neat. I would say in this first year it’s the Peach Sour. I think it will have some really really unique flavors to it. I’ve done a few other beers kind of like this and they’ve been like no other. ETF- Do you have a target date on when the move to Denver would happen? Chad- I do and that would be yesterday haha! But we are trying to do it as soon as possible. We’ve got the investment and interest there. So a lot of it is on my shoulders to get it finalized, start bringing in all the investment and to finalize our building location. I’ve been looking at a few buildings and seen a lot of great things but I’m waiting to be able to pull the trigger on those things. It’s a bummer because like I said, I would’ve like to make the move yesterday to get going, but as with every business there are always the steps and process. One of the things I am looking at to negate some of that is a possible intermediate location. ETF- A bit of brewing science now. What would be your best advice for homebrewers using brettanomyces in their fermentations? Chad-If you’ve got the ability to prop the yeast up some I would certainly recommend that. A healthy active culture is always the best and brett can be finicky from time to time. So if you can take a smack pack or a vial then get it going in a flask. It really doesn’t need to be a lot of work like a 2 liter prop or anything like that. 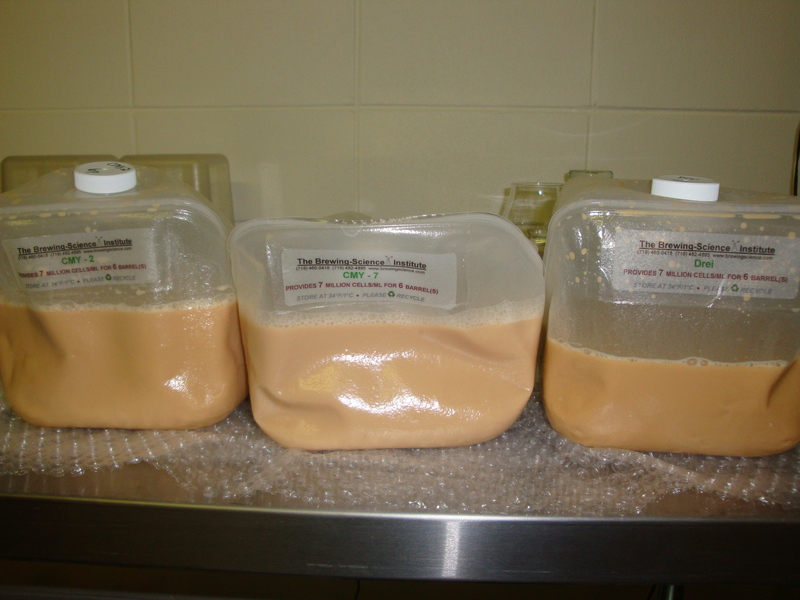 Even 500ml or so of sterile wort and just pitch that smack pack or vial into it then let it go for about 5 days. Even if you don’t have the equipment like a stirplate just shake it with your hands when you walk by. That’s going to get the brett active and acclimated. I’m very big on giving brettanomyces acclimation. So you are getting the brett used to some alcohol and starting to ferment. There will be cell growth and its going to be more viable. Pitch that into your 5 gallon batch and the fermentations will be more typical of the ones that I am seeing. At Crooked Stave I’m getting basically full attenuation in 2 weeks, but then I’m seeing more attenuation over the next few months. But in those 2 weeks I’m going from 14 plato down to 2 plato. Then the beers will continue to come down to 1 plato. Having a proper cell count and treating it like saccharomyces in a way is key to these fermentations. *After the interview we were talking more about helping brewers with the techniques of fermenting with Brettanomyces. Chad has agreed to help me with a series for the website on brewing with Brettanomyces and his theories on why to use certain ingredients in your recipes. I appreciate him lending his knowledge to this series and hopefully we can not only get some new information out there, but dispel some of the inaccurate information on brettanomyces. Fantastic read! Looking forward to Chad’s input in the future. Great stuff! I am looking forward to more. I just started my first all brett beer and am excited. Awesome interview! This answered many of my questions about Crooked Stave, which is quickly becoming one of my favorite breweries. Thanks! I realized a late draft of the transcription was uploaded instead of the final. I have uploaded the correct version (no major content change, just some corrected transcriptions and formatting). I apologize for the mistake on my part. please discuss sanitation requirements for homebrewers wanting to brew with brett. lots of myths out there I think!